Why did you start you blog? Is that will why you blog, or has your site gone in a different direction than you’d planned? Photographers, artists, poets: show us BEGINNINGS. This is quite a strange one for me to be answering, given that I still consider this blog to be in its initial stages. I am only just beginning. However, it’s been a fun week and two days so far, and I’m very proud of my little corner of the internet. In response to the prompt, the blog is still going ahead as planned and hasn’t, yet, managed to veer off into an entirely different blog-scape. I say yet, it is, after all, an impending eventuality! But, to answer the first question, why did I start my blog? Well, I wanted to connect with everyone else out there is who facing similar challenges to myself. I wanted to learn more about writing, and honing my craft. I wanted to see, if I could make this blog a success. All signs are positive so far – thank you to my wonderful followers. Previously on a website, I started a journey toward publication. I was very excited about certain routes to publication. I was set on sending out my manuscript to literary agents, and did so! I also intended to pursue self-publication as well, and my blog was intended to blog my progress on that journey. The journey slowed however, as my working life grew busier. In recent weeks, I’ve battled with the nagging pressure, to write something and do something creative with my time. Writing isn’t about ‘wanting’ to write, or wanting to be a writer’. As a writer, I can’t ‘not’ write. I am a creative person and I require a creative outlet. Unfortunately for my blog, I’ve been fairly creative at work for the past two days and so had less imaginative energy to devote to this place. However, I am committed to my wonderful followers and determined that not too many days should ever slide past, without an entry. I leave you with a photograph. 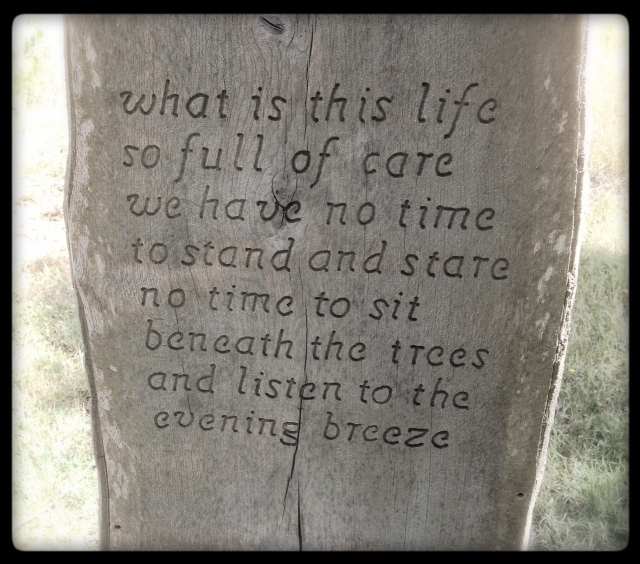 On my visit to Hatfield House over the weekend, the following words of William Henry Davies, were inscribed into a bench overlooking the River Lea. As ever, they reminded me that it’s important once in a while, to slow down and enjoy the ride. Not just race to the end. The lines are from Leisure. Pingback: What if I like, you like, we all like to be liked? | Okay, what if ? Your writing is really fun and easy to read. I have enjoyed finding your blog and reading your posts. You sound like you truly love to write and are throwing yourself full force towards your goals. I look forward to reading more from you. Thanks for sharing.